Clear Beauty™ Hydration Plus Night Cream Contains an advanced skin hydration & skin cell regeneration system, with clinically proven anti-inflammatory & non-surgical micro-lifting benefits; to revitalize replenish & energize the skin’s essential youth factors, while you sleep. 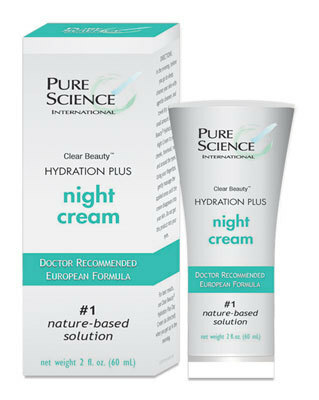 Clear Beauty™ Hydration Plus Night Cream contains the same “active” ingredients as our Day Cream. It has been fortified with ingredients to help replenish the skin’s essential youth factors plus clinically proven anti-inflammatory & non-surgical micro-lifting benefits. Clear Beauty™ Hydration Plus Night Cream offers ultra rich nourishment and hydration for your face, neck and chest, with maximum absorption to all 7 layers of your skin.